Biology is learnt through classification primarily. 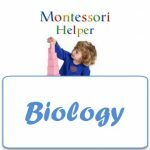 As a MontessoriHelper premium member you can access all our related nomenclature cards and interactive apps you will need for this purpose. Children love to name “parts of things” and in surprising detail. Most children also have a keen interest in learning about the human body and it’s anatomy.